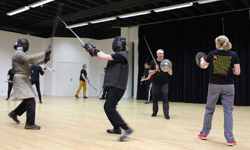 Regular training is held every Monday and Thursday from 7 pm to 9 pm at the Royal Armouries, Leeds. KDF Leeds trains principally in longsword, although we also cover other weapon systems including messer, sword and buckler, pollaxe, dagger and wrestling. Please note before taking part in one of our regular training sessions it is expected that you will have completed and passed one of our KDF Leeds beginners courses (see here for details). This helps to ensure a basic level of competence for all the attendees at that training session. Suitable club weapons and protection are provided during both beginners courses and regular training sessions, although many of our members do go on to purchase their own equipment. Normal apparel for training consists of T-shirt, track suit bottoms and trainers.